Dandelions are a fearsome thing in this household. “Let No Nose Be Left Behind”, surely must have been the operating theory when allergies were handed out in this family. You might think it’s a bit late in the season for dandelions to still be sprouting up. You would be wrong. Dead wrong. Just ask my nose. And my eyes. My eyes are crying; and they’re not even sad. We took an evening stroll recently. 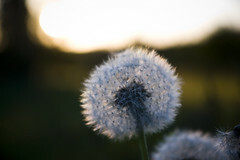 The goal, unbeknownst to us at the start, was to find and blow as many dandelions as possible. Each blow was precipitated by “Look Daddy! Look Mama! Anudder dandelion!”, followed by much huffing and puffing. All of this huffing and puffing led to many a dandelion spore floating dangerously close to our eyes, faces, and nose spaces. I turned to Sweetman to report that taking my allergy medicine today was a lesson in futility. He agreed wholeheartedly as his own eyes began to swell. When I got to the point that I thought I would rather scrape my face on the pavement than endure one more WEED being blown within a 2 mile radius of my person, all blowing ceased. Glory! I think I actually saw Sweetman do a Happy Dance. Sweetgirl, however, launched into near hysterics and announced loud enough for the entire neighborhood to hear, “Oh NOOOO! The fuzzers are all gone!”. And I said,”Amen!” Oh, yes indeedy. This entry was posted in Conversations, Family, Yes, Indeedy and tagged Allergies, Dandelions, Weeds. Bookmark the permalink. Ah, my kids love blowing those fuzzers too. I’m always swatting the kids away from me, but they are like mosquitoes, they keep coming back! So, of course, I get covered in fuzzers and the kids get covered in sneezes. Ha! Oh yes they do get covered in sneezes- as do we. When will they learn how very unpleasant that kind of a walk is? I don’t have allergies but that stuff sticks to you and are annoying so I hate them! YAY for Fall! !